Self-defense has been getting a lot of bad press lately. The news has been flooded with opinions concerning what are commonly referred to as “Stand Your Ground” laws. The catalyst for this discussion is the case of George Zimmerman, charged in Florida with second degree murder for killing Trayvon Martin this past February. Zimmerman claims self-defense. He says that Martin attacked him on the street, broke his nose, and banged his head against the sidewalk. At that point, Zimmerman admits, he shot and killed Martin. Recent medical reports tend, in the minds of some observers, to support Zimmerman’s claim of self-defense – he ended up with a broken nose, lacerations on his head and black eyes; Martin had bruised knuckles, but no other injuries, at least that we’ve been told about. Whatever the final result in the case, we can all agree that it was a tragic incident, and none of us knows for sure what actually occurred. It’s the “no duty to retreat” concept that has some people up in arms. What it means is that in Florida, even if someone has a safe way of exiting the scene, he or she may legally choose to defend with deadly force rather than walk away. And the burden of proof in these cases is on the prosecution to prove that a defendant (charged in this case with murder) was not justified in using deadly force. So you might conclude that while states such as Florida are saddled with barbaric Stand Your Ground laws, this couldn’t happen in a civilized, cosmopolitan place like New York. Well, the news is that not only could it happen in New York, it already has. And to see why, we have to take a look at the New York self-defense statutes as they exist today. “the actor is under no duty to retreat if he or she is: (i) in his or her dwelling and not the initial aggressor.” (emphasis supplied). Getting back to the debate over Stand Your Ground laws, it does appear that the only substantial difference between the laws of New York and Florida in this regard involves where the events take place. We understand the visceral reaction to being threatened with serious bodily injury in one’s home; it feels as if it’s appropriate for the homeowner to stand his ground. Indeed, this concept, originally called the “Castle Doctrine” (my home is my castle, etc. ), represents the genesis of all the Stand Your Ground laws on the books today. Logically, however, if the central issue is the sanctity of human life, why should the difference in the way the law treats self-defense depend upon the location of the act? 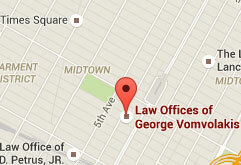 It is not for this New York criminal lawyer to opine on the wisdom of the various laws in New York State. Nevertheless, it is apparent if you are a New Yorker and would like to point the finger at Florida, look closely – there may be three fingers pointing back at you.